Over a hundred years ago, the Irish nationalist and novelist Erskine Childers, after sailing among the East Frisian Islands on Germany’s North Sea coast (German: Nordsee), used the experience as the foundation for his classic spy novel, The Riddle of the Sands. In the novel, two weekend sailors sail the same course and are caught up in Kaiser Wilhelm’s plot to invade Great Britain. Fortunately, they foiled his plans! Germany’s North Sea coast still beckons with an odd mixture of welcoming warmth and the foreboding chill which made it such a perfect setting for a turn-of-the 20th-century spy novel. Although the North Sea itself seldom reaches a depth of more than 100m or 330ft, the North Sea coast is a deeply fascinating land. The North Sea Frisians, always a hearty lot, killed a Roman tax collector in 40 A.D., and then defeated the Emperor Tiberius himself at the Battle of Baduhennawood. Some two centuries later, they took to the sea and began raiding Britain. Life on the North Sea coast, in those days, was nothing if not exciting. It has continued to be, as the Shipwreck Museum in the fishing port city of Cuxhaven will attest! No one expects you to execute the imperial tax collector, battle the Emperor, or abandon ship during your visit to the North Sea coast. Your excitement will come such activities as mixing with the hoi polloi on your visit to the island and city of Sylt, the North Sea’s place to see and be seen. The only way to reach it is either by air or by the Marschbahn train, and you’ll have to buy a day pass before being allowed to actually set foot on the silt of Sylt. When you do, head for the town of Kampen and climb the 115 steps to the top of Uwe Düne. The tallest dune on the entire island, it will give you a bird’s eye view of Sylt. Plan your next move accordingly, if you don’t head straight back down to take advantage of Kampen’s exclusive shops and the opportunity to do some celebrity watching. The Hornum lighthouse, on another sand dune at the southern tip of the island, dates to 1907. St. Severin’s church, the dunes of the Ellenbogen Peninsula, unspoiled beaches, and the 3000 species of marine creatures which live in the Wattenmeer Mud Flats Bioreserve are other options. The glamorous atmosphere of Sylt, however, isn’t typical of much of the North Sea coast. 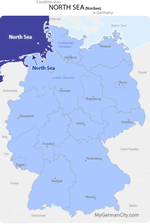 The coast’s green district, Dithmarschen District, survives on its cabbage crops, producing approximately 80,000,000 (!) of the vegetables each year. Get a good sense for this monster on the German Cabbage Route. Not to be outdone by the wineries much further south, the area cabbage growers celebrate each autumn with the Dithmarscher Kohltage, a tribute to all things cabbage-related. Cabbage (and its cousin cauliflower) is all anyone thinks about for six entire days, and two Cabbage Queens dressed in traditional Dithmarschen apparel make that seem perfectly normal! Get a taste of Germany’s ties to Scandinavia in the coastal town of Husum, where the harborside shops share Scandinavian architecture in a rainbow palette of pinks, pale blue, and tangerine. In the spring of each year, Husum stops being a North Sea town and is awash in a sea of purple, as the more than four million crocuses in Husum Castle Park burst into bloom. A network of dikes protects the coastline from the ravages of wind and tide. The dikes, on which Frisian sheep graze for much of the year, are topped with paths which hikers and cyclists can follow to the enormous (14 sq. mi/24 sq. km) beach at Sankt Peter-Ording, a.k.a. the world’s largest sand pit. Finally, one of the North Sea Coast’s biggest treats is also one of its smallest. Don’t head home without having at least one meal of tiny Nordsee shrimp, which weigh in at around 100 shrimp per pound. Potato soup with ginger and shrimp is a classic.